Each month, we publish a selection of items that may be of interest to our global readership. Contributions are welcomed; we reserve the right to edit content. Content should describe opportunities to advance palliative care and improve knowledge, skills, and networking, e.g., education and training, travel grants, access to online resources, etc. Please submit your copy to the editor, together with a JPEG image, e.g., conference logo. We reserve the right to edit content. Please also consider promoting your education and training events in the IAHPC Global Directory of Education in Palliative Care. It’s quick and easy — just submit your content online. On March 29, the Worldwide Hospice Palliative Care Alliance announced a call for proposals. Palliative care organizations and organizations comprised of people living with life-threatening illness, or organizations of older people, are eligible for a grant of up to $15,000 to fund a project to increase the voice of direct stakeholders to advance palliative care. The WHPCA has set aside $60,000, or enough to fund four projects. Applicants must be from a low- or middle-income country. The deadline for applications is 17:00 GMT, 1 May 2018; decisions will be rendered by 16 May 2018. The aim is to strengthen the voice of direct stakeholders in palliative care advocacy and increase their impact as advocates to improve access to quality palliative care. Direct stakeholders are defined as people who are currently living with conditions that require palliative care now, or may require it in the future, and those who are in older age and approaching the end of the life cycle. The WHPCA knows that social justice movements led by people affected can result in dramatic social change, as was evident in the movement around increasing access to HIV treatment. To shift the power to enable and strengthen the voice of people living with and affected by life-limiting illness on palliative care advocacy, the WHPCA grant program targets new and innovative advocacy and public engagement projects, led by — or in partnership with — direct stakeholders in low- and middle-income countries. WHPCA will accept applications in partnership with carer and family member groups, but warns applicants to be aware that, in this grant round, preference will be given to applications involving direct stakeholders. The application form, guidance and budget template can be found in this Google Docs folder or on the WHPCA website: Application Form, Application Guidance, Budget Template. Send completed applications to grants@thewhpca.org. Dying2Learn is a Massive Open Online Course (MOOC) that runs for five weeks. Anyone can sign up for the 2018 edition of the course, which starts in May. The course was developed by Care Search, an Australia-based ‘palliative care knowledge network.’ It is designed for the general public and directed at Australians, but is open to anyone. The goal is to build community awareness and foster social discussion about death and dying. How does today's society engage with death and dying? How do we use language to describe it? What does death 'look' like? How is death and dying portrayed in the media? Dying2Learn ‘provides a rare opportunity to explore community views and attitudes around death and dying within a learning environment rather than a health context,’ according to an article published online in BMC Palliative Care in February (Tieman J, et al.). ‘Enrolment rates demonstrated significant community interest and willingness to participate. Those who enrolled in the course were generally active with large number of participants viewing pages and completing activities. 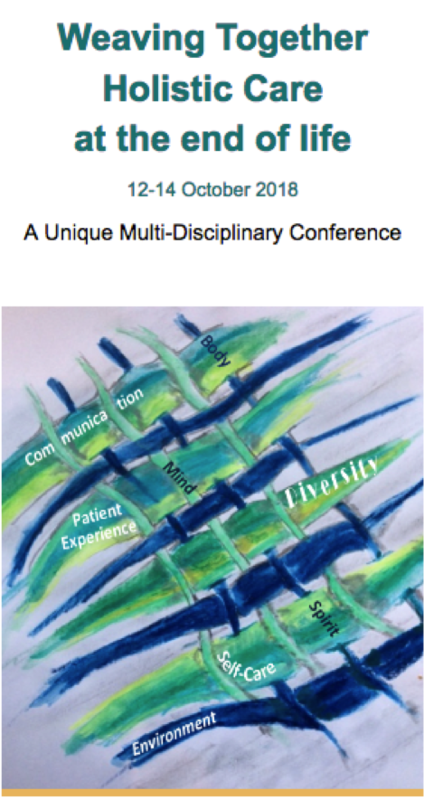 ‘Weaving Together Holistic Care at the End of Life’ is the theme of a multi-disciplinary conference being held in Leicestershire, England, from 12-14 October 2018. The conference is being organized by Hospice 23, a charitable organization formed to bring together sometimes isolated palliative care workers. Applicants are invited to vie for two £800 bursaries that cover the £250 registration, with the rest applied to conference-related expenses, such as travel or accommodation. The conference aims to ‘enable, encourage, and empower’ those who work in palliative care. An ‘informative and clinical spiritual, reflective, and experiential’ experience is achieved by way of speaker-led presentations and small group discussions. A downloadable form to apply for a bursary asks applicants to describe the organization they work with, their reason for wanting to attend, how they plan to share what they learn, and a detailed breakdown of the costs to attend and identification of other sources of funding, if any. Last fall, 40 lawyers from 16 law firms were sensitized as to legal issues involving palliative care patients in Harare, Zimbabwe. Nearly half signed up for more in-depth training. The lawyers then offered to visit patients and their families in and around Harare to have discussions that have led to concrete legal guidance. A cross-section of patients’ needs addressed by the visiting lawyers include: inheritance, maintenance, succession, property grabbing, terminal benefits, eviction, school fees, and polygamous marriage issues. All their work has been pro bono thanks, in large part, to the Open Society Initiative for Southern Africa, which provided funding to the African Palliative Care Association (APCA) and Hospice Palliative Care Association of Zimbabwe (HOSPAZ) to compensate the lawyers. In this, HOSPAZ has joined Kenya, Malawi, South Africa, and Uganda in implementing models for the integration of legal support for palliative care patients and their families to ensure their access to justice. The WhatsApp messaging platform was valuable in coordinating lawyers’ visits to palliative care centers to meet with and support patients and family members. The platform was used to notify lawyers of identified legal issues of patients, and ascertain their availability to attend to the issues. Some patients with unaddressed legal needs are hesitant to use legal services due to cultural issues and fear of retribution by family members or society. But with continued public education involving community leadership, this challenge is fast becoming a thing of the past. This work in Zimbabwe is proving that legal support is an invaluable aspect of palliative care services. Its provision must be carefully and purposively planned for, in order for it to be effective. Nairobi, Kenya, was the site of a stakeholder collaboration organized by Access Accelerated to encourage action on the prevention and control of non-communicable diseases (NCDs). The collaboration was a two-day extension of a workshop on the topic held in March. NCDs account for the loss of 100,000 lives in Kenya each year, according to a 2015 survey by Ministry of Health. 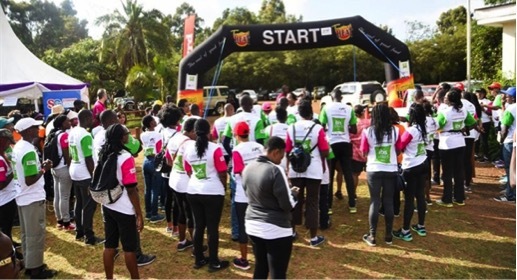 The event brought together the global community, the government, non-governmental organizations, health practitioners, caregivers and people living with NCDs (PLWNCDs). Stakeholders in attendance came from government, the private sector, and civil society, including the World Bank, Union of International Cancer Control, NCD Alliance, PATH, World Heart Federation, and BIO Ventures for Global Health. A unique feature of this event was that PLWNCDs and their caregivers were given adequate time to share their stories of delayed and wrong diagnosis, pain, poor quality treatment, stigma, and the financial challenges of managing chronic diseases. By the end of the two-day event, PLWNCDs were empowered to write a comprehensive petition to the international and national government for the upscaling of NCD care. The petition included demands for proper involvement of PLWNCDs in decision making, quality and timely care at local health facilities, education of PLWNCDs and their caregivers, qualified medical staff, subsidized health services, comprehensive insurance coverage, and government accountability, among others. Illnesses categorized as NCDs include heart diseases, stroke, cancer, diabetes, road crash survivors (injury and accidents), hypertension, epilepsy, sickle cell, bone and joint conditions, spinal cord injuries, asthma, and mental conditions among others. In March, the U.S. National Hospice and Palliative Care Organization released statistics from 2016 showing that Hospice Medicare beneficiaries with a principal diagnosis of cancer decreased while patients with Alzheimer’s or dementia rose to 18%, up from 16.5% the previous year. The annual report provides an overview of hospice care delivery in the U.S. with specific information on hospice patient characteristics, location and level of care, Medicare hospice spending, hospice provider characteristics, and more. The report includes these 2016 facts: 1.43 million Medicare beneficiaries received hospice care; the average length of service was 71 days; the median length of service was 24 days; 98 percent of care was Routine Hospice Care level (i.e., care provided at home); and there were 4,382 Medicare-certified hospices in operation. Photo courtesy of U.S. National Hospice and Palliative Care Organization. Australia’s CareSearch.com has a wealth of resources, both online and print, for those involved in palliative care. For instance, while the website navigation bar’s ‘What is palliative care?’ is intensively Australian in focus, ‘Clinical Evidence’ provides details on four categories — advance care planning, patient management, carer evidence, and service delivery — that are broken down further into a multitude of topics of interest and use to palliative care patients, carers, family members, and medical professionals anywhere. As an example, one of the 17 topics under Patient Management is ‘appetite problems.’ The listing addresses key messages, an overview, active areas of research and controversies, and references. Other topics include sections such as: ‘what is known,’ ‘contributing factors,’ and ‘find out more,’ which provides links to full-text articles. Another navigation bar topic, ‘Finding Evidence,’ is similarly organized and useful. Additional print resources are organized under 22 topics, including: communication (health team, family, and friends); dementia; feelings and emotions; bereavement, grief, and loss; pain; symptoms other than pain; medicines; patient rights; and complementary therapies. Caringinfo.org is a website run by the U.S. National Hospice and Palliative Care Organization. In addition to state-specific information (such as advance directives), there are lush offerings. The navigation bar emphasizes advance care planning, caregiving, hospice and palliative care, and grief and loss. The caregiving category, for instance, is further broken down into sub-categories: preparing for giving care, providing care, care for the caregiver, caring for children, and helpful services. The ‘Caring for children’ page identifies the NHPCO brochures (in pdf form) that visitors might find useful. A selection of bilingual documents are available in Spanish/English and Mandarin/English. NHPCO notes that all of its publications are copyrighted, and mass reproduction is prohibited. Licensing agreements and permissions, however, can be arranged. If you know of a website worthy of mention for its excellent palliative care information, regardless of country of origin or language, please contact me so that it can be considered for inclusion in future issues of the newsletter. The British Pain Society has produced a series of pain scales in multiple languages to assist and encourage improved assessment both by the health care professional and the patient for whom English is not their first language. The pain scales are recommended to be used by GPs and emergency staff, but may also prove useful in a wider range of situations in which the communication of pain is necessary. According to the society, this series of pain scales is judged to be the easiest to use and best understood of the simple scales available for adults with no cognitive impairment. The scales assess different — partly separable — aspects of pain, plus pain relief. The languages available are: Albanian, Arabic, Bengali, simplified and traditional Chinese, Greek, Gujurati, Hindi, Polish, Punjabi, Somali, Swahili, Turkish, Urdu, Vietnamese, and Welsh. The translations were done professionally into the languages most often used in the UK by adults. All the pain scales consist of the foreign language scale followed by the English language translation. The society writes that, ‘Because pain is a subjective experience there is no “gold standard” criterion for validity. However, in a broad sense these pain ratings do bear the expected relationships to related variables, such as disability and mood, and are also correlated with the amount of activation in certain areas of the brain concerned with pain processing [Coghill RC, McHaffie JG, Yen Y-F. Neural correlates of interindividual differences in the subjective experience of pain. Proceedings of the National Academy of Sciences 2003; 100(14):8538-8542]. The 2018 edition of the Asia Pacific Paediatric Palliative Care Service Directory has just been released by the Asia Pacific Palliative Care Network. It can be downloaded here. If your pediatric palliative care service is in the Asia Pacific region and you want it included in future editions of the directory, please click here. You will find an online form below the map. The ‘late-breaking abstract’ deadline is 20 April 2018 for the MASCC/ISOO Annual Meeting on Supportive Care in Cancer being held 28-30 June 2018 in Vienna, Austria. The 7th annual International Conference on Opioids (ICOO 2018) takes place 10-12 June 2018 in Boston, Massachusetts, USA. The theme is ‘Opioids in medicine: Perception and reality.’ The deadline for poster abstract submissions is 20 April 2018. The deadline to alert the ESMO with an intent to submit a late-breaking abstract is 9 May 2018 for the European Society for Medical Oncology 2018 Congress, taking place 19-23 October 2018 in Munich, Germany. Only abstracts for which no conclusive data are available at the time of the abstract submission deadline of 9 May 2018 will be considered for late-breaking status. The 22nd International Congress on Palliative Care is being held 2-5 October 2018 in Montreal, Quebec, Canada. The deadline for poster abstract submissions is 31 May 2018. The 2018 Annual Assembly by the American Academy of Hospice and Palliative Medicine (AAHPM) and the Hospice and Palliative Nurses Association (HPNA) is being held 14-17 March 2018 in Boston, Massachusetts, USA. IX Congreso Latinoamericano de Cuidados Paliativos de la Asociación Latinoamericana de Cuidados Paliativos (ALCP) takes place in Santiago, Chile, 11-14 April 2018. The U.S. Association for Death Education and Counselling is holding its 40th conference 25-28 April 2018 in Pittsburgh, Pennsylvania, with a pre-conference institute 24-25 April. The 13th Belgrade International Symposium on Pain takes place 18-19 May 2018 in Belgrade, Serbia. 10th World Research Congress of the European Congress of the European Association for Palliative Care will be held 22-24 May 2018 in Bern, Switzerland. Early bird registration deadline is 15 March 2018. The Canadian Society of Palliative Care Physician conference, ‘The Road to Universal Palliative Care,’ takes place between 31 May and 2 June 2018 in Toronto, Ontario, with a pre-conference workshop held 30 May. The Journal of Opioid Management will hold its 7th annual International Conference on Opioids (ICOO 2018) on 10-12 June 2018 in Boston, Massachusetts, USA. Early bird registration ends 15 April 2018. The Canadian Hospice Palliative Care 2018 Learning Institute takes place 14-16 June 2018 in Ottawa, Ontario. The 23rd Congress of the Japanese Society for Palliative Medicine takes place 15-17 June 2018 in Kobe, Japan. The MASCC/ISOO Annual Meeting on Supportive Care in Cancer takes place 28-30 June 2018 in Vienna, Austria. Early bird registration ends 10 April 2018. Hong Kong’s Community End-of-Life Care International Conference will be held 20-21 June 2018. The theme is ‘Innovation and Impact: The Review and Vision of Community End-of-Life Care.’ The four major foci are: Palliative and Healthcare Environment, Quality of Care, Human Resources, and Community Engagement. Registration is free; first come, first served. The Comprehensive Interventional Pain Management XIII conference takes place 21-22 July 2018 at the D.Y. Patil Medical College in Nerul, Vani Mumbia, India. A workshop is being held 23-24 June. The International Federation on Ageing is hosting the 14th Global Conference on Ageing 8-10 August 2018 in Toronto, Ontario, Canada. The theme of is ‘Towards a Decade of Healthy Ageing – From Evidence to Action.’ The early bird registration deadline is 6 August 2018. The 17th World Congress on Pain is being held 12-16 September 2018 in Boston, Massachusetts, USA. Early bird registration deadline is 21 May 2018. Registration opens mid-May 2018 for the 23rd Hospice New Zealand Palliative Care Conference, being held 18-21 September 2018 in Auckland, New Zealand. Early bird registration deadline is 27 July 2018. The 22nd International Congress on Palliative Care is being held 2-5 October 2018 in Montreal, Quebec, Canada. One of the five plenary sessions is on Global Palliative Care. Early bird registration deadline is 31 March 2018. The International Conference on Hospice and Palliative Care (ICHPC) 20th International Conference on Palliative Care is scheduled for 3-4 December 2018 in Sydney, Australia. Early bird registration deadline is 2 November 2018. The Palliative and Supportive Care in Oncology Symposium is scheduled for 16-17 November 2018 in San Diego, California, USA. Abstract and poster deadlines have not yet been determined. The 6th International African Palliative Care Conference is being held 17-19 September 2019 in Kigali, Rwanda. The theme is ‘Palliative Care and Universal Health Coverage.’ A website has not yet been set up. The 13th Asia Pacific Hospice Conference is scheduled for 1-4 August 2019 in Surabaya, Indonesia. The theme is ‘Bringing Hope to Those in Despair.’ The call for abstracts has not yet been announced. The 2019 biennial Australian Palliative Care Conference (APCC) is scheduled for 10-13 September 2019 in Perth, Australia. The 6th Public Health Palliative Care International conference is scheduled to take place in Sydney, Australia in 2019.